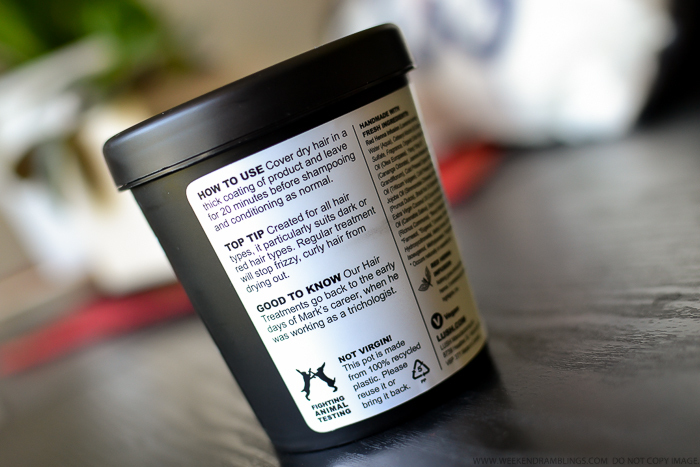 Lush Jasmine and Henna Fluff-Eaze Hair Treatment is packaged in a black tub rather than a bottle. 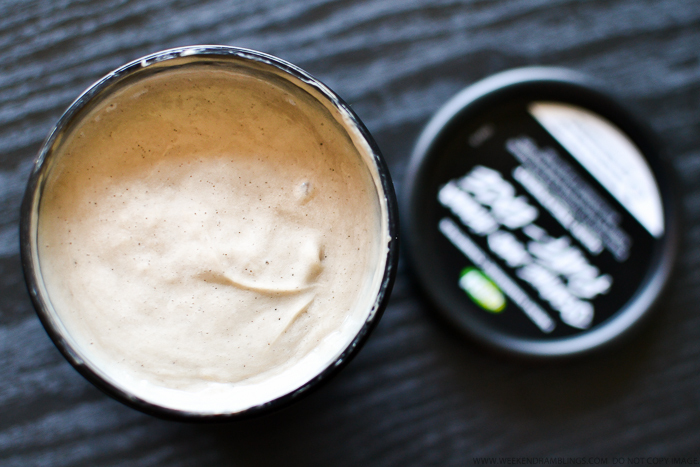 It has a thick pudding consistency and needs to be scooped out and applied on the hair. To use, apply the product on dry hair, from roots to the tips, and leave for at least 20 minutes before washing as usual. For added benefit, you can put on a shower cap, but I rarely bother with it, usually just tying up my hair with an old scrunchie. I leave this on for about an hour to even the whole day, depending on how much time I have. While washing, rinse off the hair treatment first followed by the regular shampoo and conditioner. This product lathers a bit and washes off easily with just water, but you do need to follow with a shampoo to remove any oily buildup. 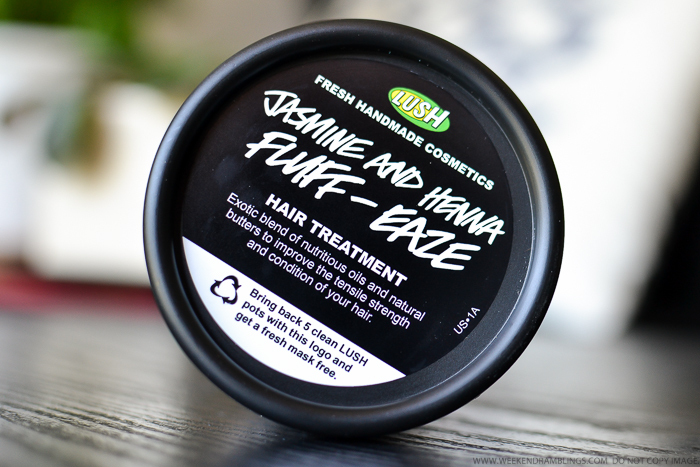 As for results, Lush Jasmine and Henna Fluff-Eaze Hair Treatment leaves my hair soft and shiny and the frizz controlled. While I will never have shampoo-commercial hair, this prewash treatment leaves my hair looking and feeling as amazing as it can ever get. 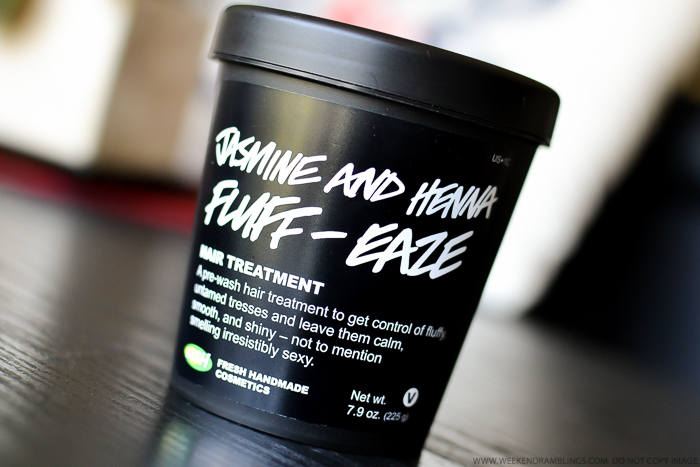 Lush Jasmine and Henna Fluff-Eaze Hair Treatment has been a part of my haircare routine for a long time now, and it is a must-have product for me, but if you have oily/fine hair, this product might be a bit heavy for you. Also, henna in this product only adds shine to the hair and does not add any color or tint to the hair, at least in my experience. I have dark hair, though, that is generally quite resistant to color, and I don't know how this product works on light hair. The only fault that I do find with this hair treatment is the really strong fragrance. It's supposed to be a jasmine-based scent, and generally, I am quite tolerant and even like quite a few strongly fragranced Lush products, but this hair treatment is way too strong even for me. 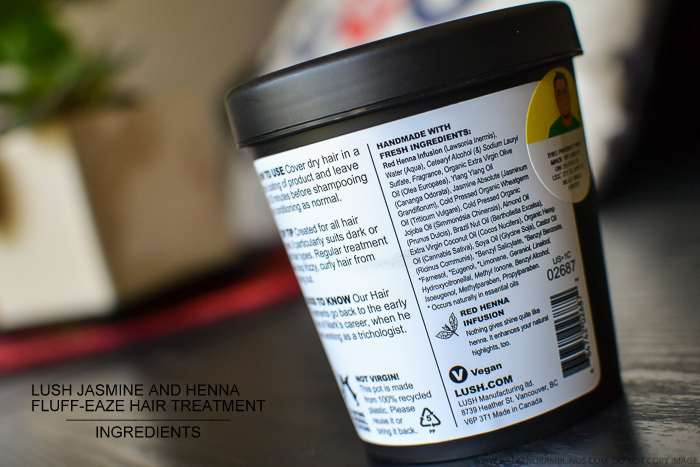 The smell lingers on in my hair even after a wash, and I really wish Lush would consider toning it down a bit! to the store and get a fresh face mask free.